I read this article and found it very interesting, thought it might be something for you. The article is called Sorcha O’Raghallaigh Interview and is located at https://www.totallydublin.ie/more/fashion/sorcha-oraghallaigh-interview/. 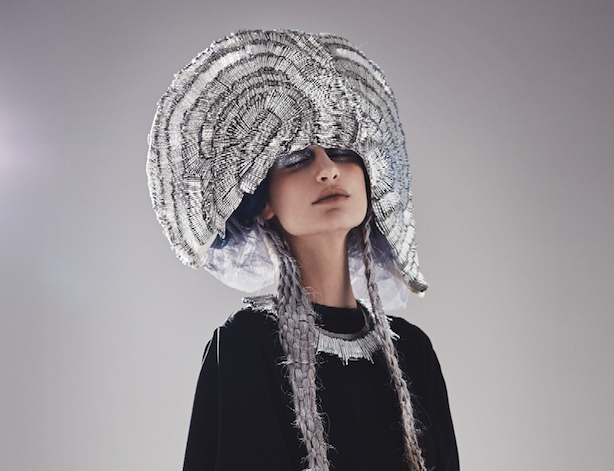 Sorcha O’Raghallaigh’s ethereal work, referencing religious iconography and her childhood spent in Birr, has cemented her reputation as the go-to designer for the some world’s leading female music artists as well as having the freedom to release collections as and when they are ready. Your work is as beautiful as it is inspired – what brought you to using fashion as your creative outlet? Drawing was my first love, but from a young age I always adored clothes. I was pretty rubbish academically, art was the only thing I felt strongly about. As a teenager I became more aware of fashion as an industry, I decided then I wanted to peruse fashion design. Also going to Central Saint Martins, where I studied Fashion Knit, was a really positive experience for me! We were really given the creative freedom and space to make whatever we desired, there were no boundaries. I loved that. Research is really important to me. I usually have one main source of inspiration and I draw the mood from that, but I also collect images that I’m drawn to all the time. Once I’ve collected enough research, I start to experiment with the textile side of things, making swatches of embellishments knits, draping these on the stand and drawing sketches inspired by these embellishments on the body, re-sketching over and over until I’m happy with a basic collection range. I’ll then start to make some toiles (mock versions of the silhouettes) and fit these on a model. We then start to alter these further, re-sketch, and add fabric development. This process can happen a few times until I’m happy with moving forward, then we make the collection. 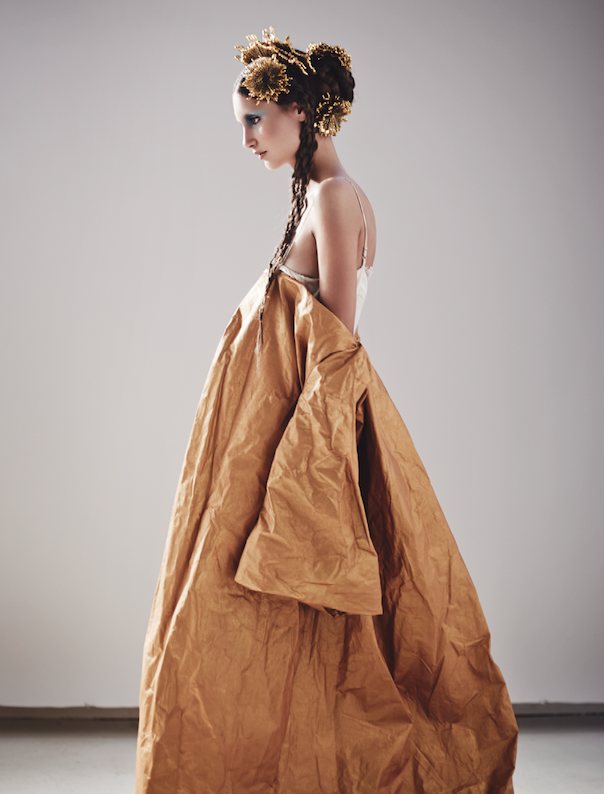 Things can still evolve as we are making the collection – it’s really an ongoing process right up until we shoot it! Why do you prefer to produce smaller couture collections as opposed to the ‘on-season’ method of presentation normally found in fashion? I prefer the ‘more is more’ approach to my pieces. Everything is created in-house including our embellishments. Some of the pieces can take months to create by hand. It’s a labour intensive process. I would rather keep things small and off-season and not compromise my aesthetic just for the sake of being on-season. Lady Gaga, Beyoncé, and most recently Kylie Minogue, have worn your creations – how did this come about? Were they collaborations? Each of these artists they have worn pieces from my collections, but I have also created custom pieces for them. When I create something custom, the process is a lot more collaborative. I usually work closely with the stylist, so the artist’s team usually have their own inspiration and storyboard for each project. I propose a series of designs using their inspiration and then they choose from a selection of sketches. We usually have little time to create it, usually three to four days, so it’s a much faster pace than on collection pieces. It involves a lot of problem solving, thinking on your feet and sleep-deprived nights! How do you feel about seeing your work on such iconic musicians? It’s quite a surreal experience! We were blasting Beyoncé every day in the studio when we were making the ‘Forget Me Not’ collection, so then to see Beyoncé shaking around in one of the pieces from that collection in her video ‘Mine’ [above] was amazing! That was the first time she requested pieces from me. A lot of the time you get great requests but nothing comes of it, you try not to get your hopes up, so when that happened it was really exciting! Tell us about your collaboration with Joyce boutique, Hong Kong? Joyce in Hong Kong, H Lorenzo in LA and now Bond and Ceremony in Ireland have stocked accessories and clothing from my collection ‘Forget Me Not’ which drew inspiration from the work of the artist Alfred Gilbert. I tried to capture the melancholy romantic aesthetic of Gilbert’s memorial sculptures and some of the harder three-dimensional, thorny qualities of his figure sculptures, so I began my embellishments with safety pins, something I felt possessed a harder feel and an object which I felt could be explored in two- and three-dimensional embellishments. Each of about 100,000 safety pins used was first threaded meticulously with glass bugle beads, then used to create motifs, or form wearable collars and cuffs to elaborate showpiece embellished crowns, capes and a jacket painstakingly hand-stitched entirely of safety pins. In contrast to these metallic pieces, I used delicate tulles with hand-stitched bugle bead motifs to create fragile ethereal gowns, I also wanted to contrast the dark mood with some playful silhouettes in I referenced Victorian harlequin costumes. Sorcha O’Raghallaigh is stocked in Bond & Ceremony (www.bondandceremony.com) and you can see more of Sorcha’s work on www.sorchaoraghallaigh.com.